This is a common, easily recognized, perennial, wood decaying, bracket fungus. It is widespread, occuring in U.S. state and every Canadian province. It is found singly or in small groups on most hardwood species and some conifer species. 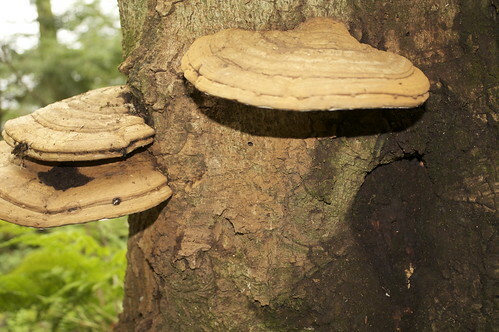 It is usually saprobic, on decaying stumps and logs, but is sometimes parasitic, near the base of injured trees. The fruiting body is woody, usually stalkless, bracket-like, fan-shaped to slightly convex, 2⅜″ to 23½″ long, and 2″ to 4″ thick. The upper surface is dull, unvarnished, rough, and often furrowed. It is arranged in concentric zones that range from pale gray-brown to dark brown. In the fall it is often powdery with brown spores. The lower surface is white, becoming yellowish or brownish with age. It instantly turns brown when bruised and remains brown for a long time. The pores are circular, small, 4 to 6 per millimeter, and are difficult to see without a hand lens. The spore tubes are in layers, with a new, ⅛″ to ½″ thick layer added each year. The spores are brown or reddish brown. Lacquered Bracket (Ganoderma lucidum) is not a perennial. The upper surface is glossy, though it is usually covered with brown spores. It is more colorful, with blends of orange, white, and brown. I found it on an old dead tree. Dr. Scott Enebak Auburn University School of Forestry & Wildlife Sciences, discusses the characteristics of common forest diseases. Fall medicinal mushroom hunting, how to find Ganoderma adspersum/Reishi cousin. http://www.youtube.com/user/Earthwalker40 then check out http://www.blogger.com/profile/16589694922742883622 I found these Ganoderma adspersum/medicinal polypore mushrooms while fall medicinal mushroom hunting in the forest , how to find Ganoderma Adspersum. In which Maximus explains the phylogeny of a Ganoderma Applanatum mushroom that he found in the woods and then made into a shelf.